Got shorter hair? Not a problem! Use a comb to apply your colour/bleach to the ends of your hair and then use a tint brush to paint individual strands around your face/through the mid-lengths. Naturally blonde? Go for a splash of colour to add that all important umph to your locks. The only question is ultra bright or perfectly pastel? Ombré hair usually involves lightening your natural hair colour (unless as in step 2 you’re already blonde and you just want to add colour). But if you fancy a stronger contrast, you can use a bleach like the LIVE Lighteners (and also keep a hair toner handy). For a more subtle contrast, you could opt for the specially designed LIVE Colour + Lift in Luminous Brown. These shades will gently lighten up to 4 shades and leave you with a soft brown ombré. Want to make a style statement? Go for brighter blonde mid-lengths and ends with chocolate coloured roots for an oh-so covetable ombré - hello hair envy! Coveting some colour to crush on? 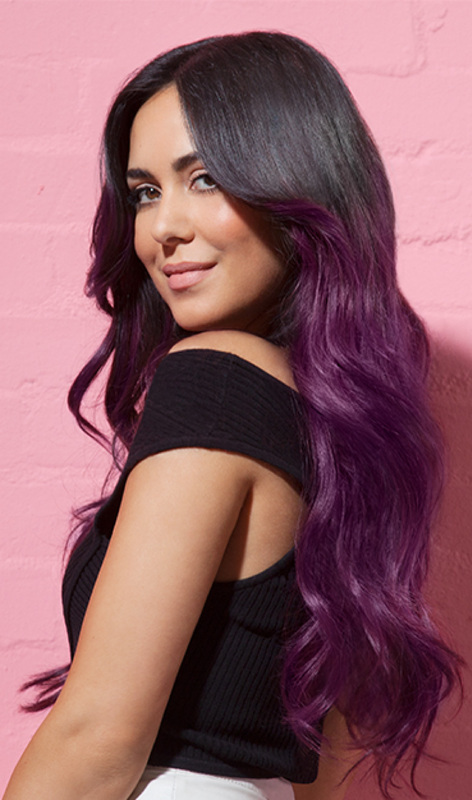 Why not turn up the vibrancy and make your ombré pop with a seriously dreamy hue! When our two fav trends collide, major hairspo occurs! Pastel and ombre is literally a match that dreams are made, the only problem is - which shade to choose! ?